Yes, please cancel if you are sick. Great! We’re done here. Just kidding, we’ve got a little more to cover. There are lots of variables to being sick. What does that even mean and why does it matter? Let’s dig in. This entry was posted in Massage on January 20, 2019 by derryberrymassage. Obligations, deadlines, appointments, meetings, work, housework, sports, everything. More often than not, it seems there aren’t enough hours in the day, or days in the week, for all that needs to be done. We’re on constant high alert. We’re always moving. When this happens, we tend to be less mindful of our eating, start chasing sleep like it’s a lively kitten, or we get snippy with loved ones and coworkers. The effects of this day-to-day stress are cumulative for most of us. Stiff joints get stiffer. Cranky shoulders get crankier, then one rogue golf swing or one heavy laundry basket makes it worse. 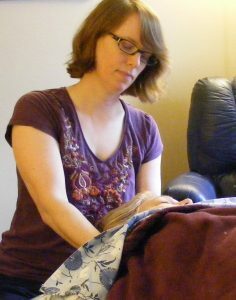 Massage is the mini-vacation you probably need, without the sand in your shoes and having to pull your computer out of your backpack. Spend some time on my massage table, taking care of you. 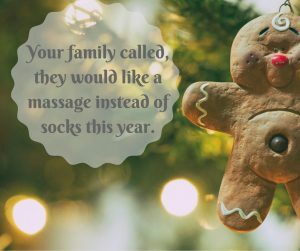 You can schedule online right here, or call me at 904-274-1584 to make your appointment. This entry was posted in Massage on July 16, 2017 by derryberrymassage. 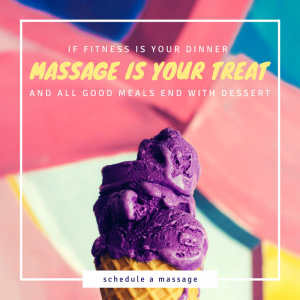 if I don’t plan for it, massage doesn’t happen. This entry was posted in Massage on October 2, 2016 by derryberrymassage.